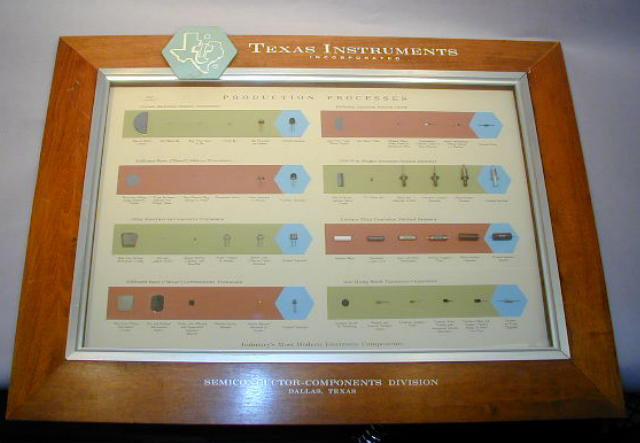 This display, built about 1958, was used to illustrate the major process steps being used in manufacturing the product lines of the division. Production steps for the following products are illustrated: Grown junction silicon transistor, Diffused-base ("mesa") silicon transistor, Alloy junction germanium transistor, Diffused-base ("mesa") germanium transistor, Diffused junction silicon diode, 1500 volt single junction silicon rectifier, Carbon film precision molded resistor, tan-TI-cap solid tantalum capacitor. Related material in collection: 1987.0487.363(Identical Display).